A maple donut with green sprinkles and a big glass of milk. Please know that I bypassed three yellow plates so I could put my donut on a green plate. I just had to do it. I celebrated my 27th birthday yesterday. It was quiet, kind of how I like them. It's quite amazing when you think about all the stuff that is packed into one year of life. All the times of joy. And the times of sorrow. For me, birthdays slip in silently. For some reason I start telling people I'm a year older than I am after my half-birthday, so it seems like 27 is kind of old news. I remember longing to be 25. I thought that was the most perfect age. But I think the Lord is reminding me that every age is perfect. Every year holds beautiful things and hard-to-swollow things. Each year makes us stronger. The age you are is exactly where you're supposed to be. 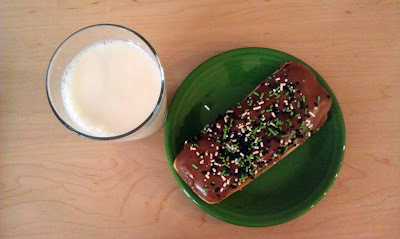 green sprinkles!! i love it!! yum! What a great reminder! I need that now that i'm in my 30s. Funny how I thought 25 was the perfect age too. I think that's the age I finally felt like an adult. :) Happy Birthday! This looks delish! Happy Green Birthday!